Time to head over to Holgate, as the city council is asking for our views on which bit of it should be blighted/destroyed by a road to the oily bit of land known as the teardrop site, where eventually perhaps we’ll see some big ugly buildings go up, which will probably bring satisfying profits to outside investors. I’m sorry, I’ll try that again. Time to head over to Holgate, as the city council would like our views on the options for the new access road to the York Central development, which is going to unlock the site, to the benefit of the residents of the city, offering well-paid employment and affordable housing. None of us know as yet how the York Central site is going to develop, but there is a current consultation on the access road options (deadline is soon: 13 September 2017). We have moved on a bit since I wrote about the York Central plans and the access road a while back. It seems that public pressure has resulted in this opportunity to comment. I can’t claim credit, I think it was probably the impressive and concerted campaign by the community around the Holgate Garden, a community green space and play area which would be destroyed by the access road going in at the former carriageworks entrance (called ‘southern option’ in the current consultation documents). The route in that many of us who have followed this issue saw as the most logical isn’t available at present. So because this is all about available funding ‘unlocking’ the site, and because that funding has a time limit on it, there are only three options. They’ll all cause disruption and destruction, but one of them appears to cause less destruction than the others — Western option 01 — so it seems logical to me to support that option. It’s more expensive, but if the teardrop/York Central development is as important as we’re being told it is then the way into it should set the standard. Being sensitive to what’s already there. If it doesn’t take that as a starting point then it’s like going back to the plans for the 1970s ring road. I’m trying to approach the consultation on this road in a positive and balanced way, but having seen the endless years of complexity and delay around the community stadium project I fear that whatever ‘unlocking’ route we choose will be a road to nowhere. That massive John Lewis at Monk’s Cross was supposed to be an ‘enabling development’ for the community stadium, I think? We got the big shops, but not the thing they were supposed to be enabling. I don’t want to sound negative. I’d rather feel positive and optimistic about the plans for York Central. 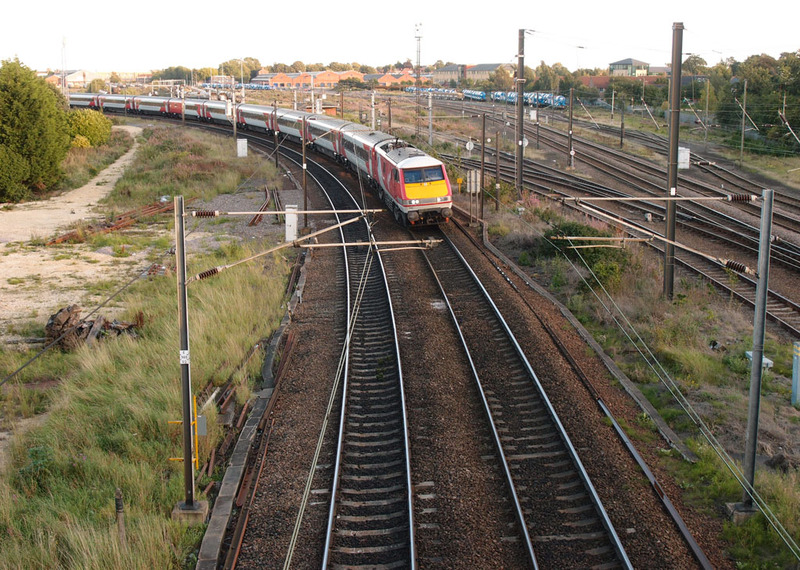 Things seem a bit better than they were when the earlier York Central consultation took place. I’m aware of two community/campaign groups focused on the York Central plans and the potential impact: the Friends of Holgate Community Garden, and York Central Action. It’s good that that residents are questioning and challenging and trying to protect the local green spaces around the site. It’s good that there’s a consultation on the access road options, and there’s some helpful information on the website about it regarding many of the aspects of the decision on what route to take. 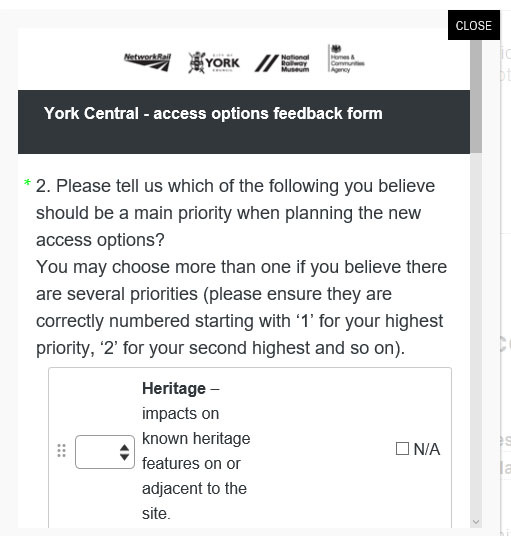 Unfortunately the survey form used on the site seems to be the only way to make comment online — a simple email address would have been much better, but I can’t see that option. If you want to comment you’ll need to select the ‘feedback’ button on the bottom right, which opens a popup with a survey form. I got quite exasperated with the embedded survey form. If you just want to add written comments you’ll first need to get past a page of options where you’re supposed to rate the importance of different aspects — it is possible to select ‘N/A’ if you don’t want to bother with that part, and you then get a text box for your comments. On my laptop screen it’s showing up as too small to type much into comfortably and I’m not seeing any options to increase the size — maybe they don’t want us to write much? — so it’s all looking pretty poor to me. Perhaps it looks better on other devices, I hope so. At the moment it’s looking like one of the least user-friendly things I’ve seen for a long time. — which isn’t confined in a small box and should therefore be easier to complete. I must get around to doing so, when I’ve published this page, and an accompanying one on the effect the ‘Western’ options might have on Millennium Green. The consultation on the access road options closes in a few days — the deadline is 13 September 2017.
for the consultation form if you have difficulties via the ‘Feedback’ button.